1. How many crabs are in a bushel / half bushel? 2. What is the pickup time for crabs? Friday Events between 3pm and 8pm. Saturday and Sunday Events between 11am and 5pm. 3. When is the steam truck coming to my local Giant / Martins? Visit our Giant Crab Wagon Event page. Our event page includes the entire schedule which is posted by weekend date. You will be able to find your store and know which date our trucks will be there steaming crabs. 4. How can I change / cancel my order? Email hooperssteamteam@gmail.com , let us know your full name, store location and what was ordered along with the change or cancellation. 5. What is the difference between #1 Crabs and #2 Crabs. A #1 crab is a better quality, harder shell, full of meat and for the most part a larger in size crab. A #2 crab is lower quality, less meat, softer shell and is for the most part smaller in size and often used in picking houses. The difference in quality is reflected in the pricing. 6. Will the crabs be seasoned? The crabs will be seasoned with Hooper’s Crab Spice Seasoning. If you desire crabs without seasoning, you will have to specify at the time of pickup and Hooper’s Crab Wagon employees will steam separate crabs for you. 7. Where do the crabs come from? Although many of our crabs are purchased in Maryland, we also buy from Delaware, North Carolina, Georgia, and Louisiana to satisfy the demand. 8. 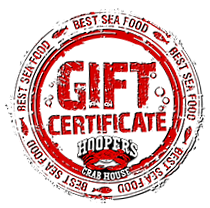 What if I don’t get my email confirmation when ordering online at hooperscrabhouse.com? Check your spam box first. If not there-chances are very good you did not properly fill out the crab ordering form. Be certain to include correct email address and choose the proper store location that coincides with the proper date. Try re submitting your order. Be certain you hit the submit button.